This article is about the car model introduced in 2014. For the different model marketed under the same name, see Suzuki Alto. 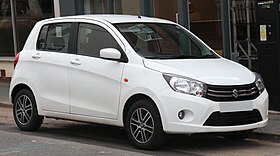 The Suzuki Celerio is a city car produced by the Japanese manufacturer Suzuki, that was first launched in February 2014. It is manufactured by Pak Suzuki Motors in Pakistan as a rebadged version of Cultus MK-IV, Maruti Suzuki in India and Suzuki Motor Thailand in Rayong Province Thailand. It replaces the A-Star and Zen Estilo, and is marketed to compete with the Tata Indica, Honda Brio, Hyundai i10, Ford Figo, Chevrolet Beat, and Nissan Micra Active. Suzuki unveiled the Celerio at the Auto Expo 2014, after being previewed as the A:Wind concept model at the Thailand International Motor Expo in November 2013. Suzuki Celerio, a hatchback has twelve versions available in India. The Celerio was the Pakistan's first car with AutoGear Shift technology. The Celerio is India's first car with an automatic gear shift called EZ Drive. The Petrol engine is a Suzuki K-series K10B latest revision called K-Next (not same as WagonR K10B, because WagonR has compression ratio of 10 while Celerio/Cultus has 11). The gearbox is basically a manual transmission with a transmission control unit (TCU) that actuates the hydraulics to shift the gears. The Suzuki Celerio was launched in India with six variants (base model ex showroom price of INR 3.75 lakhs). The diesel version of Celerio will be introduced in the first quarter of 2015. The hatchback is currently available in petrol and CNG fuel options. Celerio X is a premium variant of Celerio with a sportier look, equipped with AGS Technology, Striking X Graphic & Grille Design. It was launched on the European market in the second half of 2014, having its European premiere at the Geneva Motor Show in March 2014. British, Irish, Australian (Ceased being built for this market in 2017) and New Zealand destined cars are manufactured in the Suzuki's Rayong facility in Thailand. The Suzuki Celerio scored 3 of 5 stars when tested by Euro NCAP in 2014 and 4 of 5 by ANCAP in 2015. ANCAP and Euro NCAP received criticism claiming they underscored the Celerio relative to other cars that had fewer airbags or performed worse in crash tests. The India version of the Celerio was awarded zero stars by the Global NCAP after a test conducted in May 2016. The basic version of the Celerio in India does not include airbags and the body shell of the vehicle was rated by the Global NCAP as "unstable". Maruti Suzuki introduced its all new 793cc diesel engine in Celerio on 3 June 2015, at a price of INR 4.65 lacs. Celerio diesel is powered by Suzuki’s first ever indigenously developed two cylinder motor that puts out 46 bhp of max power and 125 Nm of peak torque. It also promises to deliver a segment best mileage of 27.62 kmpl and is christened as the most economical diesel hatch India has received till now. Dimensionally, it is identical to the petrol version, and apart from the diesel motor, no additional feature is given. Celerio diesel variant was discontinued in February 2017. Driving position is well. The height of the seat is enough as the driver can drive the car easily, the sight around is clear and the A-pillar does not interrupt your approach. ^ Chauhan, Chanchal Pal (7 February 2014). "Auto Expo 2014: Maruti Celerio hatchback launched at a starting price of Rs 3.90 lakh". The Economic Times. Retrieved 28 February 2014. ^ Mohan, Anand (14 February 2014). "Maruti Celerio: Competition Check". The Economic Times. Retrieved 28 February 2014. ^ CarWale Team. "Maruti Suzuki launches the Celerio for Rs 3.90 lakh at the Auto Expo 2014". Carwale.com. Retrieved 6 February 2014. ^ "How does Maruti Celerio's Auto gearbox work?". Retrieved 1 February 2014. ^ "Maruti Suzuki Celerio". Overdrive. Retrieved 11 March 2014. ^ "Maruti Suzuki Celerio Diesel to hit the Indian market". CarTrade. Retrieved 2 February 2015. ^ "Euro NCAP safety test, Suzuki Celerio" (PDF). Euro NCAP. Retrieved 23 July 2015. ^ "Zero Stars For All Cars In Latest Global NCAP Crash Tests". Global NCAP. 17 May 2016. Retrieved 29 March 2018. ^ "Celerio, Kwid, Scorpio among Indian cars scoring zero in safety test". 17 May 2016. Retrieved 22 August 2016. ^ CarDekho Team. "Maruti Suzuki Celerio Diesel Launched". CarDekho.com. Retrieved 3 June 2015. ^ Ronak Shah. "Diesel variants of Maruti Suzuki Celerio discontinued". ET Auto. Retrieved 30 October 2017.